This is a high strength glucosamine and chondroitin formula that also provides potent levels of other nutrients believed to be useful for joint care. Each ingredient has been selected based on their different, but complimentary functions, and are presented at levels that are nutritionally relevant. Three tablets provide the full 1500mg of glucosamine sulphate, the level used in many studies, as well as 300mg of chondroitin sulphate, and 150mg of MSM per daily dose. The powerful bioflavonoid quercetin, has been included at a potent 60mg, plus 1200mg of ginger (as a concentrated extract), as well as a 400mg of rose hip. Few, if any, joint formulas provide these potencies in a single formula. ChondroitinSulphate - 300mg, MSM(Methylsulphonylmethane) - 150mg, Quercetin - 60mg, Ginger - 1200mg (provided by 60mg of a 20:1 extract), Rose Hip - 400mg (provided by 100mg of a 4:1 extract). 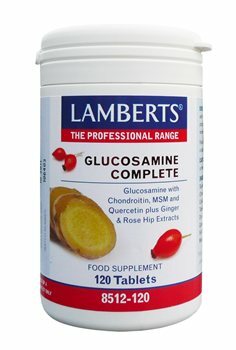 Glucosamine Sulphate 2KCl*, Modified Starch, Chondroitin Sulphate (from fish), Cellulose, Methylsulphonylmethane, Tablet Coating (Colour: Titanium Dioxide, Glycerin), Rose Hip Extract, Quercetin Dihydrate, Ginger Extract, Silicon Dioxide, Stearic Acid, Magnesium Stearate. *Glucosamine Sulphate 2KCI is a pure compound derived from shellfish. Take 3 tablets daily with a meal, or as directed by a practitioner or pharmacist. Do not exceed recommended daily dose. Do not exceed recommended dose. Do not take if pregnant or breast feeding. you are getting desorganised !!! 3 (three )weeks and I have not received my goods ?????????????????? getting expensif ! no discount .No notices! If not able to send good refound monies!! My doctor suggested I use glucosamine and chondritin for my Osteo arthritis, and this is easy to swallow and seems to be effective. EXCELLENT PRODUCT AND SERVICE. CONGRATULATIONS !! !